I’ve been sipping my way through a huge many smoothies (slurries) these past few months. So much so, I’ve been buying my fruit and veg from H & W Produce. Their slogan, Spend Less for Fresh. So you understand why I am going there. It’s cheap. And the quality is there. I often thought it would be a shop that would smell of rotting fruit with fruit flies buzzing around. But that’s Safeway. H & W is clean, busy and well stocked. Sure some of the produce had seen better days, like mangoes for instance, but if you don’t mind a slightly wrinkled, slightly sticky mango for really really cheap, this is the place to go. And if it is not adorning a fruit bowl, but is sliced up for a smoothie, who cares what it looks like? You might need to exercise a bit of patience with the line-ups though. Just warning you. Our home has never had so much fresh fruit! I feel good about this. Especially because we’ve been EATING all this fresh fruit. However, try as we might, we always seem to over buy bananas. So, despite Michael’s daily banana and my morning banana-in-a-smoothie ritual, we still have a few bananas that turn black. Sure bananas are cheap enough I can throw them out without guilt, yep, right in the garbage bag and right down the chute! With a satisfying thunk when it hits the bin 14 floors down. But today, the frugal Baba within me decided we needed banana muffins. 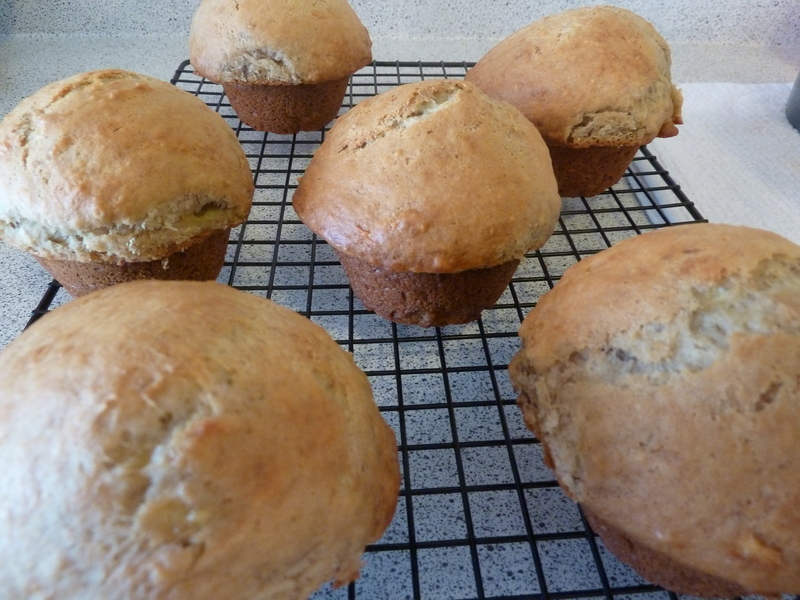 Good old fashioned banana muffins made with white flour and white sugar with nary a flake of oat bran in sight. Banana muffins that we smother with butter as soon as they are cool enough to handle. These are bad-boy banana muffins, that if they were human, would be wearing leather and riding Harley’s looking cool, stopping at Tim’s on Whyte Ave. for a double-double and honey cruller fix, allowing flakes of icing to settle in scraggly salt and pepper beard that flaps around on windy days. Mash the bananas. Add sugar and slightly beaten egg. Add oil. Mix dry ingredients together, then add to banana mixture. Fill tins and bake at 350F for 25 minutes. And for those of you tired and fed up with winter, I have some good news. 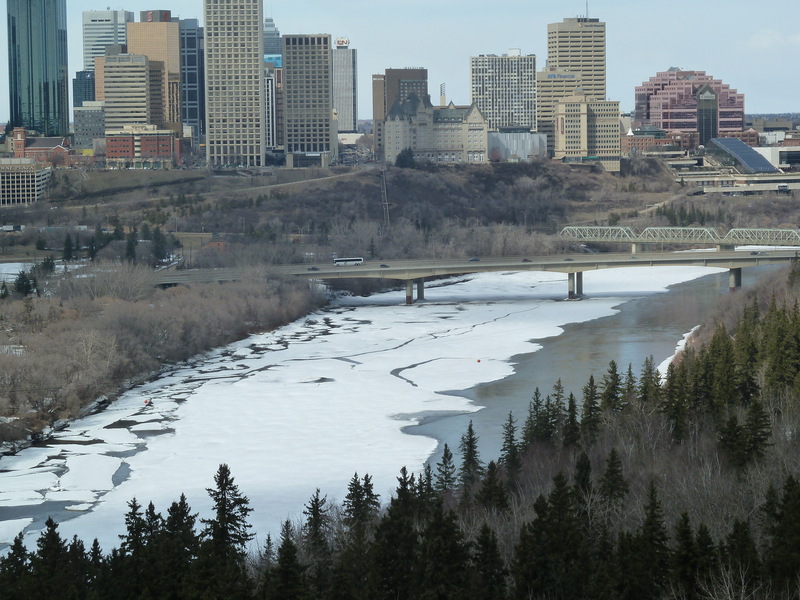 The river is indeed thawing. 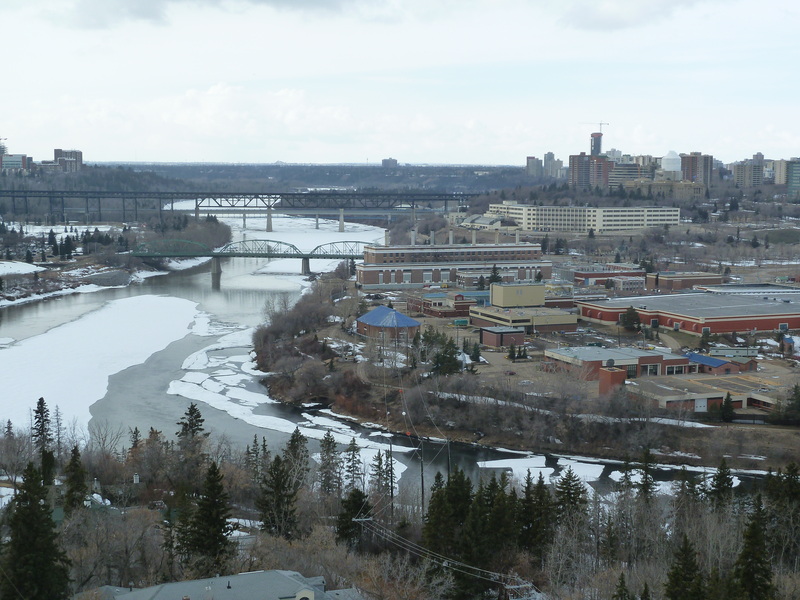 Previous Post Come on Edmonton! It’s APRIL!